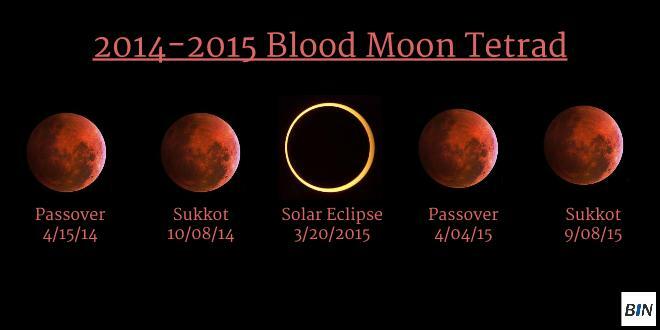 Tonight: Pesach 2015 and Third Blood Moon!!! This is the second Passover in a row with a potentially VERY significant and ominous blood moon in the sky. As we have discussed before, the planet is in the midst of a Blood Moon Tetrad, a series of four blood moons within a two year timespan. Amazingly, this is one of the extremely rare times that all four fall on the major Feasts of Yehovah (the Lord). Last year, Passover and Sukkot with the identical pattern again this year. Even more interesting was a total solar eclipse that just occurred on the first day of the Hebrew calendar and the midpoint of the four blood moons…. A mystic rabbi living in southern Israel is urging all Jews to pray and repent as the third Blood Moon of a tetrad cycle approaches. Rabbi Amram Vaknin, who similarly predicted the events of the Gaza flotilla and the Carmel forest fire in 2010, and Operations Pillar of Defense (2012) and Protective Edge (2014), warns that Israel is facing great judgment and potential danger at this time. One of Rabbi Vaknin’s students, Gil Nachman, spoke to Breaking Israel News and, quoting the sage, explained that the numeric value of the Hebrew word for blood, dam, which is 44, alludes to the 44th president of the United States. Vaknin predicted that the 44th president would bring bloodshed (dam) to the Jewish people. It should be noted that the rabbi made this prediction before President Barack Obama’s election to office. Vaknin believes that only 44 plus one, or 45, can counter the danger represented by the blood moons. This, he says, is Adam, or Man, which in this case refers to the Messiah. Very interesting and definitely bear watching. The prophet Joel warns of signs in the heavens before the great and terrible day of Yehovah. May we draw near to Him and His Messiah as we enter the secret place. This entry was posted in A Thought... and tagged blood moon, blood moon tetrad, Pesach 2015, Rabbi Vaknin, signs in the heavens. Bookmark the permalink. 2 Responses to Tonight: Pesach 2015 and Third Blood Moon!!! I read this, too. Typically, i shy aware from the numbers game – but i may be wrong to do so since I understand that the Hebrew language includes numbers in its characters and words. It is important that we continue to watch as He told us to do! I, too, shy from numbers, etc, but we are specifically told there will be signs. So, like you, I watch and hold these things with an open hand.